All Staff will receive periodic Data of the Day! email updates from our Intensive Intervention teacher, Mr. Ackerman. Data chosen will reflect varying aspects of our PBIS framework and is intended to help CGCA continue to grow and improve in our implementation and fidelity. PLEASE! be sure to read and heed the information contained in those emails! Information will also be featured here on this webpage. December 2017 Data for the day! Solution: 1. Modify the work load and presentation of the work and make it engaging! 3. Conduct "transition talk"; "In 5 minutes, we will be ending our breakfast time and getting ready for spider math!" Unfortunately, we still have students in our building not carrying point cards daily. The point cards are the cornerstone of our entire program. Every student in our building needs a point card every day! ​Thank you for being attentive to this! 2017-2018 First Installment of "Data for the Day"! Please look through the data and see if this data is relevant to your frequency and trends of distributing referrals. Perhaps, you can spot some areas of your day, week and or particular students, classes and behaviors that you are more prone to address. Self reflection assists in us maintaining a proactive environment as opposed to a reactive one! We are all off to a great start, but remember students are in our building because of behaviors. We will see behaviors! How we address the behaviors is our control! 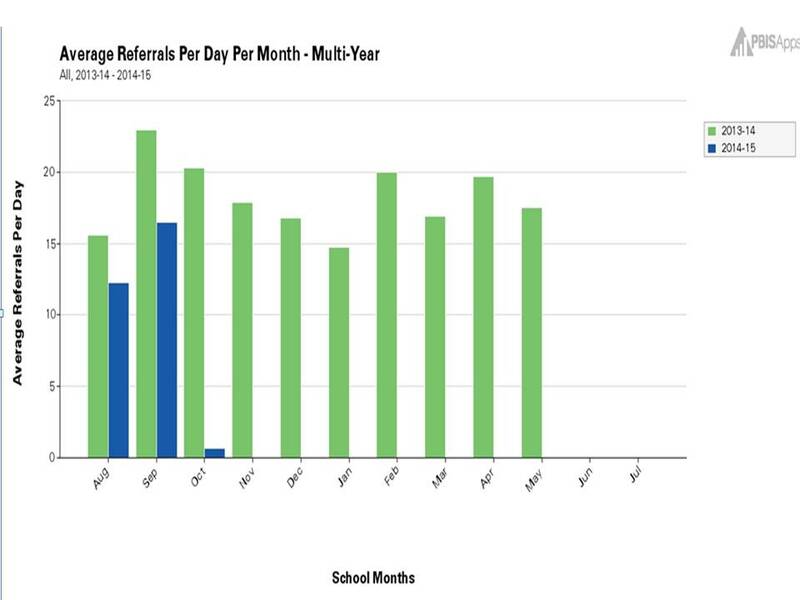 Data for the day takes a look at the number of referrals per day per month over the last four school years. 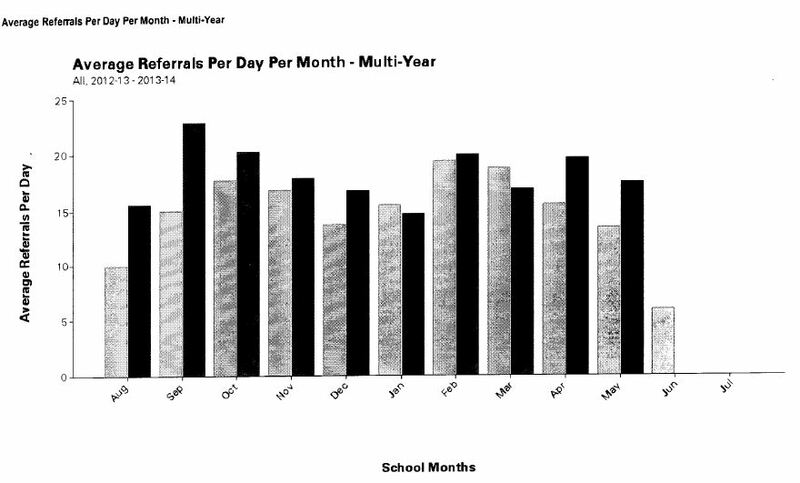 At the end of school last year, PBIS status marked us for need improvement for number of referrals. We developed a plan to help reduce referrals and improve on our status. Based on the chart below, it appears that we have made significant progress in obtaining our goal! 2. Staff awareness of positive saturation of the program as opposed to punitive application! 1. Continue to follow ALL aspects of PBIS! Sell it! Buy it! It works, and this is what we do as a school! 2. As several tough school months arrive, remember 4 to 1! Pro-active vs. Re-active! and avoid resistance! Currently we have 42 referrals from the gym and playground. This figure compares to last year's 47; however, looking back at the previous 3 years, the totals have been 31, 32, 29. Furthermore, out of the 42 referrals 40 were due to physical aggression, fighting or bullying! 1. We have grown complacent with structuring our PE classes and playground time. 2. We have multiple classes in the gym and on the playground at the same time! 1. Maintain structure,create physical education opportunities and organized meaningful activity; this is the time when our students need the MOST structure not the least. PE should have lesson plans! 2. There is a reason that we have small classroom settings. Adding 2, 3 or even 4 classes together in a chaotic environment is a recipe for disaster! If our grouping is occurring because of scheduling conflicts please contact your program managers to sort these out. However, if we have multiple classes together because our staff needs to cover break times and or we are socially interacting as a staff, we are misguided. PE and playground time is a wonderful opportunity for our staff to not only show how activity can be fun and safe, but also show how social skills can be used during sports! Take advantage of this moment! Today's data shows our school's referrals per behavior. Throughout their school experience (other school settings) behaviors have prevented many of our students from learning consistently. At Coastal, we have helped reduce this trend by eliminating OSS and ISS and rarely calling a parent/guardian to take their child home. As teachers, we must also help reduce out of class time and work on having our students in class as much as possible. As a staff reasons 2, 4 and 6 are very good reasons to receive an II. However, while we acknowledge this as being troublesome in the class, we have to reduce the number of referrals for disruption, defiance and language. These behaviors sometimes do indeed warrant a referral, but many of them are contributing to lost class time. At Coastal we are striving to be better! Thank you for accepting feedback! 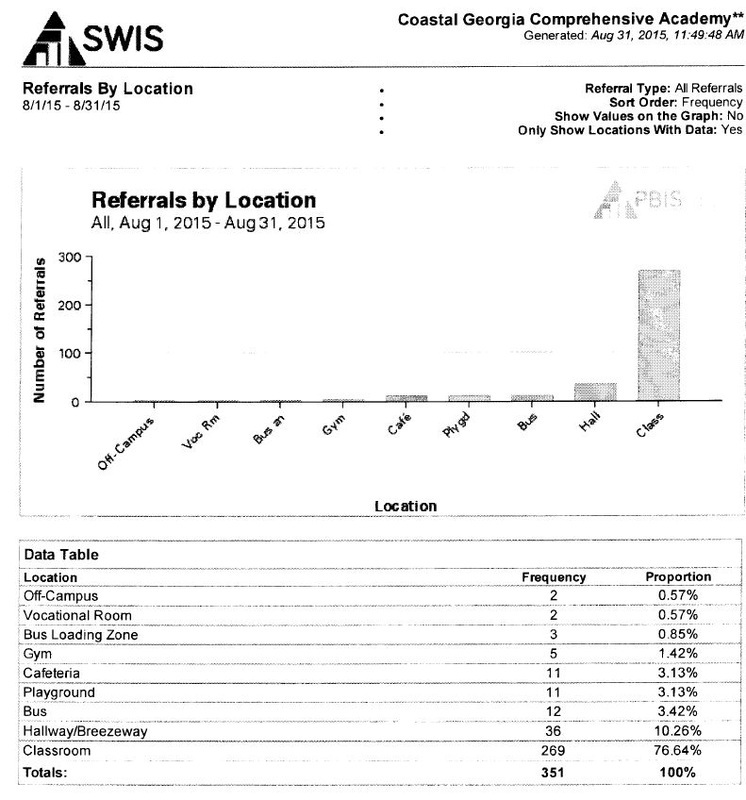 Today's data shows our school's referrals per location. At pre-planning we emphasized the need for an increase in structure during PE and playground time. We identified the understanding that our student population escalates in behavior risks during these times. 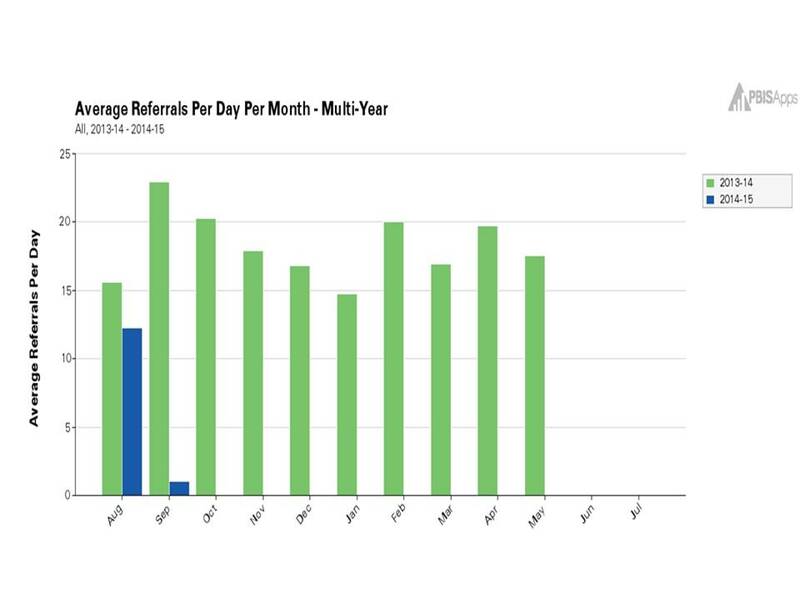 Our data has shown a significant decrease in referrals for both PE and playground time! Keep up the high level structure and remember SUPERVISION! Today's data centers around February! Borrowing from Dr. Norwicki, February is the longest month of the year! Our school year compares to relationships. The hardest part of a relationship is the start and ending. August, September and April, May reflect these difficulties. However, between October and January many of our students make signigicant progress, the easiest part of a relationship(the middle). February represents a recognition to some that an end is coming. Therefore, students demonstrate more behaviors. 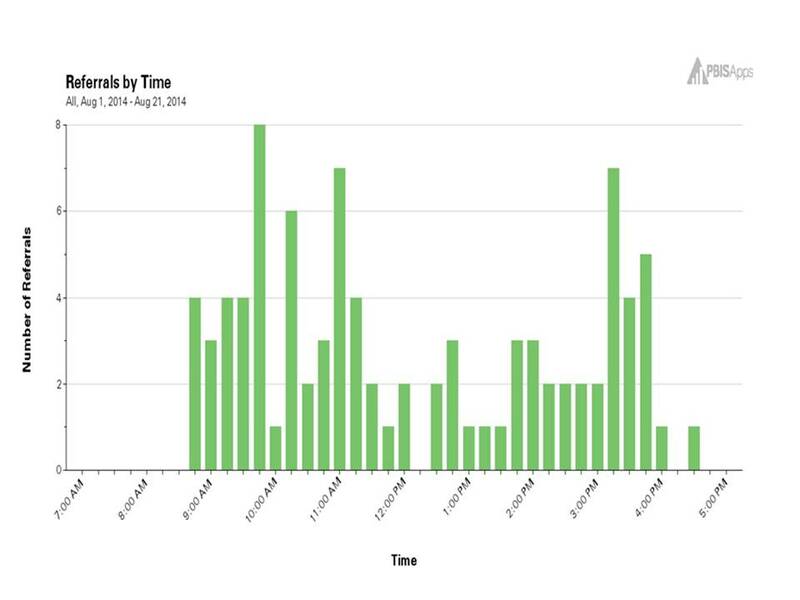 Our data indicates this spike(see attachment). How should we use this information? use them as an opportunity to build a better relationship! Careful not to create our own behaviors just because we are expecting them! Maintain more structure to show them consistency in our relationship. Ultimately, February should not be an excuse for us to accept behavior, but instead a moment to develop and secure relationships! Today’s topic: The Chronic offender! 1. Our top 10 offenders represent 25% (1 quarter) of all of our school’s referrals! 2. Our top 20 offenders represent 40% of all of our school’s referrals! Having about 20 classes in our building, approximately one student from each class creates 40% of our behavioral issues! What would our school and your class look like if you could solve this one person’s behavior? I recognize that the data analysis was molded for a particular purpose. Nevertheless, take a moment to think of the student in your class that creates the most behavioral referrals. It is our responsibility and purpose to create positive progress in improving this one student’s behavior. A comprehensive team approach and subsequent improvement of this individual creates a better learning environment and ultimately a more successful class and school. Your Goal: Do not ignore that chronic offender. Instead, up the efforts to solve! Thank you! 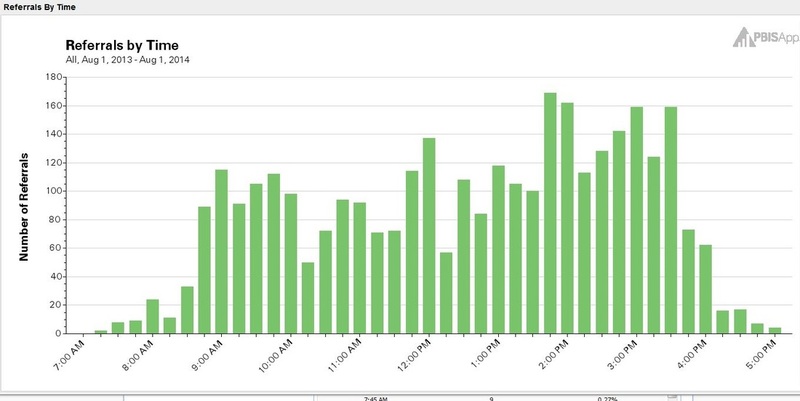 Issues exist throughout the day; however, our data demonstrates a concentration of referrals after 3pm. Despite appearances of this being our time to “ease” off and relax; in contrast, this is our time to be most structured! Let’s be Pro-active and avoid having to be Re-active! For the second month in a row, we have accomplished our goal! Excellent use of intensive Intervention! End of the day, start of the day, lunch, PE and outside time are key moments to maintain good structure and engaging work! 1. Initial goal accomplished! August data shows improvement from last year! Congratulations!! 1. Our afternoon spike is in line with previous years. A reminder to maintain good structure and consistent organization. 2. Lunch time looks good! 3. The morning increase may be a product of getting used to school, buses, medicine and other changes to their summer. Nevertheless, maintaining good structure in the morning will help!